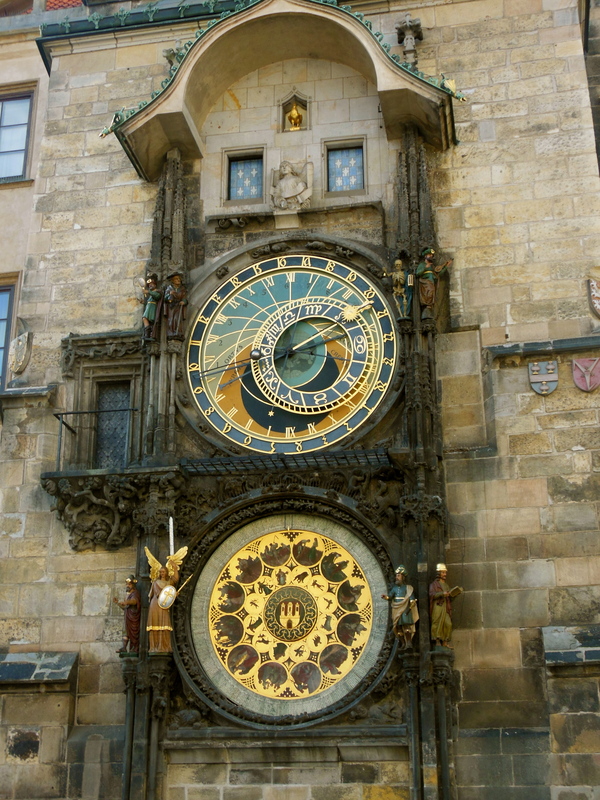 Here’s a photo of the astronomical clock, one of many photos I took last year while visiting Prague. It’s a beaut! I’d be rich if I had a dollar for every time someone said to me, “Consider the alternative,” in response to my lament that I don’t like getting old. For I have considered the alternative. Every stinking time, frankly, though I’m not sure either is a great alternative. In fact, I’m still considering it and wondering how I can decline both of these choices. But, you know who’s really to blame for this conundrum I’m in? Think about it. From the moment we’re born we’re living on borrowed time. Which is why I’ve decided to boycott this fleeting commodity. It’s built a web around us, and we’ve all fallen prey to it. I can’t wait for Christmas or (insert other holiday here)! I can’t wait for my birthday! I can’t wait for school to be over! I can’t wait to go to college! I can’t wait to go abroad! I can’t wait for my cousins to visit! I can’t wait to be married! I can’t wait for those jeans to go sale. I can’t wait for the divorce to be final. I can’t wait for (add whatever it is you couldn’t wait for here)! Now, all these years later, you might ask yourself, what exactly was the rush? Why were we in a hurry, trying to speed things up, when time moves fast enough on its own–without any help from us? In fact, about the only thing most of us seem happy to wait for is the alternative: death. And yet death waits for no one. Or so they say. Time. It’s around us but it’s invisible. You can hear it rushing by, sometimes faster than the speed of light. It reflects on us in how we age, in the saggy parts and crow’s feet we develop over time. And the gray hairs, too. We can have them colored but only for so long. Time always has the upper hand, watching us throw money away in an effort to stay youthful looking. Time always wins. Time. Seems like it’s nothing more than a cliche. All good things must past. Time flies when you’re having fun. Time is of the essence. A wrinkle in time. A stitch in time. Time is money. Our very existence depends on the time. It won’t standstill even if we hold our breath. No matter how many times we say, pretty please. For every season, turn, turn, turn…there’s a ticking clock. The Big Clock. Did you ever see that film starring Ray Milland and Charles Laughton? It’s a race against time that’ll have you at the edge of your seat. Though, here we go again, trying to beat the clock. Out-fox it, if you will. But guess who always wins? Time. It has the upper hand (pardon the pun). And the little hand, for that matter. Always. Unless, of course, you’re lucky enough to have a time machine. 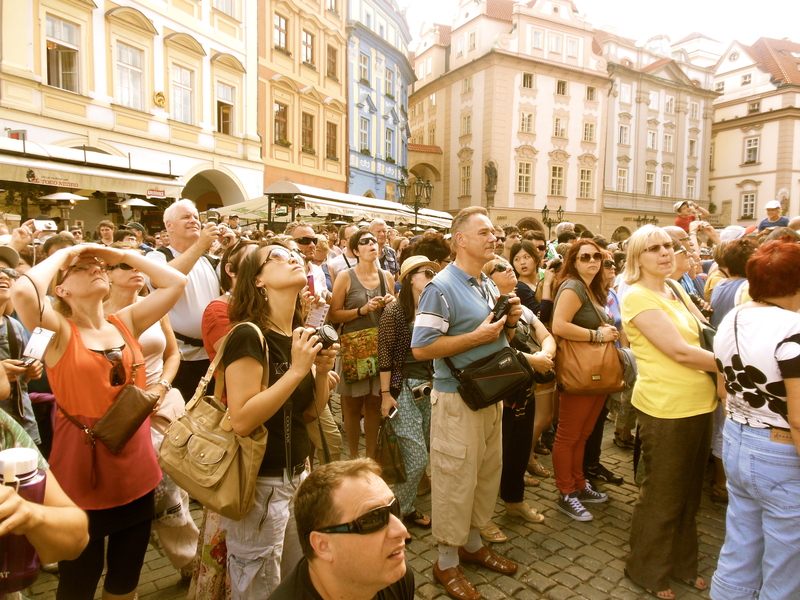 People staring at the astronomical clock, waiting for it to strike the hour. But all they’re really doing is watching time pass them by. How I wish I had one. I’m sure I’m not the only one who fantasizes about having access to one. Many a book has been written about time travel. Many a film has been made, entertaining the notion. It is my favorite fantasy. To travel through time. In fact, if you ask me, the best part of the 1960 film version of The Time Machine, is when Rod Taylor gets into the machine in his house, and as he travels into the future, he looks out the window at a mannequin in a window display across the street. While he’s looking at it, he sees the outfits on the mannequin rapidly change, each one showing a little more, ahem, leg than the last. Like a parade of fashions as he passes through each decade. I have a feeling if any of us really had a time machine, nearly all of us would want to go back in time, and not necessarily forward, to the scary unknown. But what do you think? If you could travel in time, where would you go and why? As for considering the alternative, I’m actually wondering if I can call a lifeline. I’d like a second opinion, after all. I’d like to go back, if possible, to re-confront individuals more assertively, without malice or hatred, just conviction. I’d like to go back and say “No” where I said “yes” in some cases, and “I know I can” when someone said “I betcha can’t”. I’d like to go back, love intact, and rewrite some chapters, but I can’t. I can, however, write some new ones–right some wrongs in the process. Thought-provoking and deeper of a question than I initially thought. Thanks for the inspiration, Monica. How brave of you SomerEmpress to go back to address wrongs. What a fascinating thought. Glad my post sparked some new ideas for you. Which is exactly what I love about blogging. The possibilities it brings. This is such a ‘timely’ post for me. I’ve been having a few ‘aging’ issues – complications, horrors of menopause. Yikes. But as to the time I’d like to experience, 1920’s Paris – Hemingway, Fitzgerald, Gertrude Stein. It was such a writing culture, an artistic haven for all artists really. Wouldn’t that just be grand? Renee, Paris then would be so snazzy. But give me Manhattan then, during the time of the Algonquin Round Table, with Dorothy Parker, one of my favorite, witty writers, playwrights George S. Kaufman and Robert E. Sherwood, and Ruth Hale, a freelance writer who wrote about women’s rights. I would’ve loved to have sat at that table. Some of my favorite “Times” are when I read words, observations, and stories that make me a better human being. Oh, Kim. You have a way of making me feel very special. Thank you so much! Means a lot to me. Read the post. Time well spent. Can we live longer if we save time instead of spending it ? Monica, love the look of fall on your blog. Beautiful. I’ve been on my own journey, traveling back to the Winter of 1796 when Jane Austen met Tom Lefroy. Oh to go back in time. I wouldn’t mind spending some time visiting. well, there’s the small issue of plumbing and deodorant. I would go back and talk to my dad, it’s been 18 yrs since he passed and I still miss him, I would love some advice. Then again, he would say, stay where you are, life is short enough. So I take it one day at a time, I can’t freeze time, I can’t stop it from going forwards or backwards – I don’t know which is worse. The time changes make me feel like I am constantly running a race. I wish It would stop. Thank you as always, MM. You see? I was right. Most people given the choice to travel in time, want to go backwards. I’d go to Jane Austen’s world if it meant meeting Mr. Darcy and he looked like our dear Colin. Have you been watching “Paradise” on Masterpiece? I think you’d like it. I’m totally enjoying it. Not the same period as Austen but a British period piece nonetheless, based on a novel by Emil Zola. I’d go to ancient Egypt. But I have a feeling i wouldn’t be prepared for the roughness of life. Just fo an hour or so, or freedom to return anytime! Jodi, You mean Egypt at the time of King Tut? That’s practically where history started. How exciting! I touched on this theme in my own post this week, even mentioned time machine. Maybe Dr. Who can swoop in and take me back to my younger self (with all my worldly wisdom) so I can re-chart my course…? Is that a good idea? I tell myself there are no regrets, none, and there can never be otherwise my life would not be so precious. Yet we do wonder about roads untraveled from time to time. Loved the photos of the time pieces. Glad you enjoyed my photos, Brenda. Going back to our youth and having the wisdom to make better choices sounds intriguing. Thanks for sharing your take on the subject! This is such a beautifully written post! As we approach the holiday season I consider myself so blessed to bring in the holidays again. Recently I saw this. “Old age is a privilege, some people never get to experience it.” That was sobering. Oh, and may I add another movie? Ground Hog Day fascinated me. The characters were stuck over and over on that one day reliving it many ways. One of the reasons I was drawn to watch it is that was my parents’ anniversary. Georgette, I am very familiar with the film, Groundhog Day. One of my all-time favorites. At the time it came out, I was going through some hard times. The film spoke to me. It resonated and served as an inspiration to me to make each day count. I love the lessons of the film. I don’t know that I would go back, no I am fairly certain I wouldn’t. While some things in my history fairly sucked, I think changing them would also change me, perhaps a real fundamental part of me. So no, I think I wouldn’t go back. I don’t want to go forward either, just want to live life. Val, maybe time travel is best left to the movies and to books. It’s a great fantasy that could cause more havoc than it would be worth, if it was real. Thanks for reading! Time… It’s for the tulips. I think. Or not? Monica, your perspective on life never ceases to leave a ridiculous grin on my face–even when I’m reading your blog at 5am. I’m the queen of dreaming of more hours in the day so that I can squeeze more minutes full of fun, but I think the trick is to stop thinking about how much time we do or do not have and just enjoy “being” in the moment. Becky, thanks so much. Let’s be clear though: There simply are not enough hours in the day. Period. I’ve always felt that, though more so in my adulthood. So much to do and so little time. Sigh. How exciting to be in Times Square then. Must have been so amazing. Me? Well, back then, right after 9/11 flights, hotels were so cheap, remember? Because people weren’t traveling. So what did I do? I took my kids to Vegas, baby! They were too young too drink or gamble, but we visited the wax museum, saw a show for free! We stayed at the MGM Grand and the show was thrown in. The price we paid for everything including our flights, was ridiculously low. I’ve never seen such steep discounts since. Wow! Great piece of writing, Monica. If I could go back in time, there are certain moments I would like to revisit, questions of departed loved ones that I didn’t ask when they were alive, maybe my best ride on a horse, but all-in-all, I’m happier in my current decade than I’ve ever been. As for death, I have a feeling it’s much like birth, a beginning rather than an end, though I do hope my “time” is a lot further down the road. Jayne, I hope you’re right. I’d love to think of death as a beginning. Right now the only plus I see is that it’s an opportunity to finally put down whatever burdens or worries we’ve been carrying. Super post, Monica, and I do love your photos! Why is it that children are always looking ahead to something exciting, while seniors regularly look back?? My late dad used to say that each age has its beauty and that we should enjoy whatever blessings we’ve been given. Time, I think, is one of those blessings. Of course, it’s just a measurement. We could as easily have counted “time” with seeds, but a clock is so much more practical! While the idea of traveling either back or forward in time is intriguing, I don’t think I’d want to do more than visit. And that, just for a brief period. Sure, there are lots of things I see as “wrong” with the present, but isn’t that just the spur we need to address them and make them better?! Oh I agree, Debbie. Visit only. There’s no way we could stay, and mess up the balance in the universe. Nope. Just a short visit, 2 weeks tops. I’d love to see my parents again and ask them questions I never did before. Find out more about what they were thinking, the paths they chose, etc. If only. Monica, great post, I for one don’t have TIME to respond to this post adequately, but since I know TIME is of the essence, I’ll make this short and TIME my response so that I don’t respond like I have done TIME after TIME, especially since TIME is money and I have to get back to work. I’ll think I’ll just take the TIME to live in the moment; after all, it beats the alternative! Very clever, Susan. The thing of it is though, most of us are so busy doing whatnot that we don’t have time to reflect on the past or ponder the future. We’re living in the moment, but not even it a thought. Sigh. Somebody once said you can tell when you’re getting old, you start looking back rather than forward. Yes as kids we always said roll on summer/autumn/winter etc. But we were never happy when the time we wished for arrived. In fact of course time is just a measurement of some arbitrary point. Here in the UK a couple of hundred years ago time was different all across the country and roughly measured on the location of the sun and the season of the year. We did not get a standard time across the country until the coming of the railway, which gave us a need for a standard time for the timetables. I don’t have a clock visible from either of my two desks in the office, when I did time seemed to go very slowly, a day goes much quicker when I don’t have a clock to glance at. To be honest I would not like to either back or forwards. If I went back I might change something which would mean that I would not be doing what I do now which I enjoy very much. Going forward would spoil the reason for getting up in the morning, which is to see what the new day brings…. Well then, no wonder I wrote this. I’m getting old! Of course when you’re a kid, what have you to reflect on? What you did yesterday? Sheesh. It’s not until you reach a certain age that you have enough to look back on. Apparently this is the week to wrestle with time. I am a big fan of the list of movies (or books) that you’ve listed. Time travel is fascinating as a concept. I had a friend who theorized time travel would never happen, not because it wasn’t possible, but because if it was inevitably someone would go back to it’s invention and stop it. Humans apparently don’t like time to be as ambiguous as it really is. You’re right. Have you seen the cable series Continuum? They kind of do that. Ha, ha! Frankly, I’d like to phone a friend. Still, you are so right about the I-can’t-wait line we uttered so often as kids. Somehow I’d forgotten about that. Amazing how time also dulls the memory. I suppose, if I could go back it would be to 1980, so I could have postponed my first year of college and spent more time with my father. Hope your week is going well, Monica! Kathy, like I said, most of us would want to go back in time. Imagine if you could and see your dad and ask him all sorts of questions for your book. I’d like to go back to my childhood and spend an afternoon talking to my mother and listening to her tales of life in Venezuela. Maybe this time though, I’d be recording it or at least taking notes. By the way, I’ve been thinking of you and Sara, because of what’s going on in the Philippines. Wondering you’re take on it, given what you both did for Haiti. Maybe you’ll post about it?